Looking back over the past few years, some have a tidy, linear career path. Others’ professional journeys are a series of unexpected twists and turns. Kianosh Pourian is a technologist with 20 years of experience in the web development industry. After working at Staples for over eight years, Kianosh set out on his own—right in the midst of the great financial crisis. He found success with his own consulting firm, went through a merger and then his new company experienced a lull in the pipeline. Never expecting an offer for acquisition at that exact moment in time, that’s exactly what happened. With the deal inked, Kianosh went from an organization of seven people to being part a 150-plus company. Months later, the office Kianosh called home was shuttered. Throughout this rollercoaster ride, Kianosh has stayed true to founding principles. Before being acquired, Kianosh’s company didn’t have a vision statement. It had one word, and that word was “empathy.” In many ways, he’s come full circle, back to the desire to venture forth and build new things. Kianosh joins us to talk about the lessons life has to teach us and how it’s always best to go with your intuition. Eager to connect with fellow owners, improve your business and find inspiration? Join us at Owner Camp. Biz Dev Camp at Viget: Sellout alert! There are only two spots left for Biz Dev Camp D.C. at Viget. Join us March 19–21, with an optional Presentation Skills Workshop on March 22. 2019 Digital PM Summit: If you’re a Digital PM or have a DPM in your life, get in on super early bird pricing for the Digital PM Summit, October 20–22 in Orlando. Super early bird tickets are on sale until February 15, or until all 50 tickets sell out. Don’t wait to get yours. Mailchimp: Mailchimp has tips, case studies and best practices to help your business grow. Sign up for their partner program to take advantage of everything they have to offer. VOGSY: If you’re using the Google suite of products, you’re ready to give VOGSY a look. From initial quote to final payment, VOGSY helps improve visibility, reporting and business outcomes. Carl Smith: Hey, everybody and welcome back to the Bureau Briefing. It's Carl and with me today, I have a friend of mine, who I first met at UX Fest, an event put on by Fresh Tilled Soil where he gave a presentation about introverts that changed the way that I communicate with people. Carl Smith: And he's here today to talk to us about this rollercoaster ride he's had over the last three years, from starting a company, merging a company, getting acquired, all this stuff happening to where he is today. So, please welcome to the show, Mr. Kianosh Pourian. Kianosh Pourian: Thank you. Thank you for having me, Carl. Carl Smith: You're welcome. And I'm just glad I nailed your name. I feel really good about that right now. Kianosh Pourian: Got it right. Carl Smith: Proud of myself. Kianosh Pourian: I'd be too. Carl Smith: So, bring everybody up to speed on kind of where you were three years ago. Kianosh Pourian: Well, let me go a little farther back, in 2010. Kianosh Pourian: 2010, after about eight years of working at Staples as a full-time employee, I wanted to move away and move into new opportunities. And I left and I started doing some freelancing and contract work. Kianosh Pourian: And about a year within that period, I decided I'd like to be more than a freelancer, more than a filler within a project. I wanted to be more involved in the architectural side and the decision-making and the contribution part. Kianosh Pourian: So, I started my own consulting firm called Cielo Concepts. That was in May of 2011. It was still a company of one. I was picking up projects here and there and working. A little further down the line, I grew enough that I hired my first person. Carl Smith: I think everybody listening can appreciate that. Kianosh Pourian: Right. Being responsible for somebody else's livelihood was very nerve wracking for me, but I got over that. So, we expanded a little bit. It was two of us and I started, again, growing more. So, with a decision between hiring more people or subcontracting some people, initially, I decided, "Okay, let's fill this with subcontractors until I decide what the next steps are". Kianosh Pourian: That is when I got introduced to another company called ThoughtSynth. That was a company of two people, Eric Brown and Martin Bures and they were doing the same thing as us, kind of consulting, and we talked. I said I needed some help, subcontracted them out, and we started working together on a project. Carl Smith: Okay. So, you had been running for about four years. Carl Smith: After eight years at Staples, good for you, man. It's like you said, "I'm just going to try this". You run your own thing for four years, you subcontract out to them, and then that goes pretty well? Kianosh Pourian: Yeah. Yeah. Well, what's funny ... I mean, if I go back, at the end of ... And so, when I left Staples, it was March of 2010 and I don't know if you remember, end of 2009, beginning of 2010, that was pretty much the financial crisis, the housing stuff and everybody was saying, "No, just go be stable. Get a full-time job". Kianosh Pourian: And I was like, "I don't know. I feel like the market's going to bounce back. I'm just going to go freelancing". And everybody was just like, "What are you doing? What's wrong with you?" So, that was a big leap of faith that I took. And I don't know, personal opinion, I feel like, as an entrepreneur, there's a lot of leap of faiths that you're going to take throughout the process. Carl Smith: Go against that stream. Carl Smith: Make that choice nobody's making. Yeah, we started our shop in 2003, right after the bubble burst. I was like, "Oh, it's not going anywhere". So, that's great. Kianosh Pourian: It's sad. So, and then, just trying ... Getting over all the nay-sayers telling you, "What are you doing?" And all that. Kianosh Pourian: So, yeah. End of 2015 subcontracted ThoughtSynth out. So, it was me, my employee, and Martin Bures. We started doing a project together and we sat down and talked a little bit as we were doing the project. And we seemed to have a lot in common and our companies were at pretty much at the same level. Kianosh Pourian: And I had reached a point of either hiring more people or kind of partnering with somebody. And I started the conversation with them and they were very receptive. So, we kind of decided, "Okay, there's Cielo Concepts. There's ThoughtSynth. Let's just merge together". Kianosh Pourian: And we created a new company called Iotopia Solutions. Initially, the name was around an amalgamation of the word, "IO" and "utopia". So, we put it together, made it Iotopia, but as we were looking at it, there we saw the "I-O-T" in there. And one of the things that Martin and Eric were doing ... They were doing a lot of connected devices work. Kianosh Pourian: Martin was an electrical engineer ... or he still is, actually, and we were doing some of that work. And it was a good getting together of us, because I did the software side, Martin did the hardware and the connected part, and Eric Brown, he sort of sat in the middle. He did the middleware, the data part of it, the data analysis and things like that. He was a big Python guy. Kianosh Pourian: So, he was very adept at getting this information and running it through analysis. So, it worked out really well for us there. Carl Smith: So, how did you approach ownership? When you sat down to look at the merger, what was that conversation like? Kianosh Pourian: It was very simple. We were like, "Hey, what are your plans? What are our plans?" We reached a point where we said, "Okay, here's ... ". I open up the financial books. "Here's where I am financially. Here's where you guys are financially". Kianosh Pourian: We didn't feel like we were at a position of purchasing each other, so basically, what happened is, we just brought together all of our network, all of our clients, and we set a drop-dead date that said, "Everything after ... " I think ... We established ourselves February of 2016. We said March of 2016, we're going to let all our clients know that, going forward from March on, they're going to be invoiced as Iotopia Solutions. Same service and everything, just that. Kianosh Pourian: We divided everything three ways. There was the talk of titles. We decided, initially, that we're all going to be principle partners and we're going to try to figure out our roles, how our roles evolve as we go through. I think that decision has its pros and cons. Luckily for us, it worked out for us. We weren't title-greedy or role-greedy and it so happened to evolve that I kind of took the leadership role and those guys kind of took the development and the management roles of other parts. Kianosh Pourian: So, it worked out for us really, really well. I knock on wood that, that ... I don't know if I'll ever be able to replicate that, because we were smooth sailing going through. Carl Smith: So, you do the merger. Carl Smith: They start doing most of the work. You're kind of the front man finding the work? Kianosh Pourian: Well, so, initially we were all billable. We ended up having a big client that ... One of the things that we would do, going to our clients, was we would offer them a tech analysis. We would say, "Before you hire us or anything, let us come in, somewhere between two to six weeks, depending on how complex your tech stack is. Let us evaluate it. Let us interview all the people that are involved. Let us look under the hood and all that stuff" and what we would do ... At the end of that, we would give them a ... somewhere between a 30 to 40 page report. Kianosh Pourian: That would include, "Here's where you are. Here's where you're trying to go. Here's the options that are available to you. And here's what we recommend the direction that you go. And if you go with our recommendation, here's how long it's going to take and what it's going to cost you". That worked out for us really well, because not only do we get familiar with the company, but they were familiar enough with us to say, "Yeah, you guys know what you're doing". Kianosh Pourian: And it was kind of what I would call the dating part of the consulting part where we kind of get to know each other. I think the report was quite extensive enough that we would tell them, "This is the roadmap that we would follow if you hire us, but if you're not going to hire us, you can easily take that and run with it as you will". Carl Smith: But nobody ever does. They always stick with who brought the roadmap. Kianosh Pourian: Yes. Yes. That's a little, shh, trade secret that ... But no, I mean, it's a good introduction. And it worked out for us. I mean, luckily for us, we didn't have a bad client, but if we saw a kind of a negative vibe, we would extricate ourselves and say, "Here's what we think you should do, but I don't think we can do it for you". Kianosh Pourian: But we never got to do that. So, yeah. We were doing well. And so, we had this big client that we were ... At that time we had grown to about six people and we had a big client. I was billable. Those guys were billable. Everybody was billable for us. We worked for about eight months and we ended up losing our advocate at the client and as it turns out, no matter what they say, we had a meeting with them, there's like, "No. No, no, you guys are doing fine. Continue what you're doing". Carl Smith: Because you had a big client that came in and it was a big runway and you were going. Oh, it's such a story, yeah. Kianosh Pourian: So, at that point we sat down, the three of us, and we said, "Okay, one of us has to do the biz development side of things". And I drew that straw. Whether it's the long straw or the short straw, I'm not going to say, but I drew that straw and so I ended up doing biz development. Kianosh Pourian: So, fast forward a little bit to about September of that same year, 2016. We lost our client. So, one of the other things that we decided to do between the three of us, that quarterly we would pay out dividends to each other, but we wouldn't pay out the dividends in one-thirds. We paid it out in one-fourth and we took a quarter of the dividends and set it aside. Kianosh Pourian: This was for our ... what we called our sort of our rainy day fund or our RND fund, whatever we wanted it to be. So, as a result of that, we were not hurting that much and we were not desperate. We had enough that we could pay ourselves and our employees for three months, at least. Kianosh Pourian: So, I started doing biz development and we started going forward and at that time I had reached my optimal skill level of doing biz development. As a developer, there's so much I can do. You're laughing. Carl Smith: So, when you say you reached your optimal skill level, does that mean you realized you couldn't do any better? You had hit the ceiling of what you were going to be able to do? Kianosh Pourian: Yes and no. I had reached the level of ... We had exhausted our immediate network. The going outside required a bit more aggressiveness that I didn't feel like I had. Carl Smith: I am going to explain to my wife that I have reached my optimal skill level with folding the towels. And I've tried. I swear I've tried and I've hit that optimal skill level. So, we're going to go outside of this relationship and get a towel folder. Carl Smith: I love the way you said that, though. That was beautiful. Okay. So, you realize that you're going to have to go outside. That's not in your comfort zone to do outbound. So, how did you approach it? Kianosh Pourian: So, we were at a crossroad of hiring somebody or getting in outside company or something like that and around that time I get this phone call from a guy and I was getting a lot of phone calls from recruiters and stuff like that. So, for some reason I answered this one and I was like, "Yeah, yeah, yeah". He was talking and all that stuff and I'm barely listening and all that stuff. Kianosh Pourian: Then he starts talking about synergy and acquisition and stuff like that and I was like, "Whoa. Whoa, whoa. Can you rewind for a second? Did you say, 'acquisition' and are you talking about us acquiring somebody? Because we're not there yet". Carl Smith: And had been looking for work for a few months. Kianosh Pourian: Right. Well, no. No. I mean, we ... like I said, we weren't hurting. We just lost that one big client and ... but yeah. We were doing okay. Carl Smith: So, you had capabilities. Carl Smith: But you didn't necessarily have a pipeline and you weren't broke, but ... So, I'm just curious how this acquisition comes about. What was it that they saw in the way you were presenting yourself that they were like, "We want that"? Carl Smith: Okay. Well, and your name ... I'm sure on every web search. Carl Smith: There you go. Kianosh Pourian: Well, so the name of the company was Spiria and they had done some work in the embedded systems and the IoT side of things, but they were looking to expand. They're a Canadian-based company, based out of Montreal. At that time they had two locations, one in Montreal and the other one in Gatineau, which is a suburb ... across the river from Ottawa. Kianosh Pourian: So, we started talking. I told my partners about it and we were all on ... We were like, "It doesn't hurt to talk. Again, we're not desperate. We can go along". And we treated this as another client. Sort of let's prepare for it. Let's research them. Let's see how things work out and all that stuff. Kianosh Pourian: So, and we continued everything else going on. And we didn't stop and hold back and say, "Oh, wait. We're going to get acquired. Everything's all set". Because one of the things I didn't want to do is that if we, at the end, we put all this effort in and we don't get acquired, I didn't want to be again holding the ... holding an empty bottle and going, "What's going on?" Carl Smith: No. That extra coat of wax on the Ferrari. Carl Smith: So, what ends up happening? Carl Smith: So, you started talking with them. Kianosh Pourian: Yeah. We interviewed them. They interviewed us. We went there. We went up to Montreal. They came down to Boston. It was a year-long process. Some of it, because we were small and we were doing a lot of things, we didn't have a lot of time to go to it, so it took a year, but we interviewed them. Kianosh Pourian: One of the things I was looking for in a company and one of the things that when I built the firm was that I didn't want to ... I had done projects for agencies before and I didn't want to be an agency that kind of gets their people working 60, 70 hours a week, work-life balance was very important. I wanted to have those things. Kianosh Pourian: To me, I'd rather take less and pay my people more and not worry about the bottom line as much. Not that I'm saying I don't worry about the bottom line, but I didn't want to be that sole thing. And a lot of companies have mission statements and value statements and stuff like that. We didn't have a statement. We had a one word and our word was "empathy". Kianosh Pourian: And the empathy for us started with ... Our empathetic approach started with us to our employees and we asked our employees to pass that along to our clients. So, that's what I wanted and those are the discussions I wanted to have with Spiria. Carl Smith: Without getting into too much in the way of details, was it an offer you were really happy with? Did it feel good at that moment while you were signing? Like, "Wow, we've done something". Carl Smith: Yeah, it is. Kianosh Pourian: We felt like we got a decent offer. Kianosh Pourian: There was ... It was not all paid at once. It was, like everything else, it was over three years. Carl Smith: So, you signed the deal. Everybody starts working, and what happens next? Kianosh Pourian: Well, we ... I mean, we were obviously very excited about getting started. Being part of a bigger team. We automatically went from seven people to being part a 150 plus company. Kianosh Pourian: Yeah. So, that was interesting. With it, it came ... the benefits of having somebody else take over finances, somebody else take over HR, somebody else ... So, the multiple hats I was wearing, I was able to kind of hand those off and concentrate on what the ... the task at hand. Carl Smith: It's a growth opportunity and a learning experience. That's what we say, Kianosh. Kianosh Pourian: Yes. Yeah. So, yes. So, I went through the growth opportunity. Yeah. So, I mean, things went well. We were given autonomy. We pretty much were running autonomously and managing the Boston branch. I had weekly meetings with my boss, quarterly meetings as we went along. Kianosh Pourian: That went ... It went as well as expected, so, yeah. We were going along. We looked at hiring more people. We started looking at different industries to go after and things like that. Carl Smith: So, what were the immediate changes? Let's say that you're in the first three to four weeks, along with having other people help you, how was it going, just work-wise? Kianosh Pourian: Work-wise, things were going great. The transition for our clients ... It was a process to say, "Okay" to send out a kind of a letter or an email to our clients saying, "You knew us as Iotopia Solutions. Now we're Spiria Boston. Nothing has changed" and things like that. So, we wanted to reassure our clients that everything was okay. Kianosh Pourian: We had reassured our employees ahead of time, "Hey, guys. Here's the transition. It's happening. If you have any questions, any issues, let us know". Nobody really raised their hand to say anything or have any complaints with that. Went okay. Kianosh Pourian: So, yeah. The clients were happy. They continued with us. Nobody said, "Oh, now you're part of a bigger team. No, go away". So ... and it gave us much more ... a bit of leverage to go back to our clients and say, "We used to be six people and you asked us earlier to do something like this. We didn't have enough of a workforce. Now we do. Hey, let's start that conversation again". Kianosh Pourian: So, that was a nice opening to go back into some of our clients and say, "Hey, you remember this thing that you wanted to do? Let's help you out some more with that". Carl Smith: So, it sounds good. It sounds like it took off on the right foot, but then, what happens once the honeymoon's over? Kianosh Pourian: Right. The honeymoon ... yeah. So, fast forward to about 10 months later, Spiria decides to close the Boston office. Now, I've told this to a few people and they're like, "Oh, yeah, well, that's a natural acquisition stage of things". I don't think our situation was the natural acquisition part of it. I think ours was different. Maybe somebody can tell me otherwise, but nevertheless, they decided to close it. Kianosh Pourian: Now, for me, right? That was end of August that we pretty much closed the Boston office. I closed the doors and I put away the key and stuff like that. So, for me, it's like having a breakup of a relationship. I want to be fair to all parties, so I don't know how much I can say about that and honestly, I think there's two sides to every story. Kianosh Pourian: Pointing a finger on the other side, so I think since it's a fresh breakup, I think my role in this is to look introspectively and to see what I could have changed with the way things went. Kianosh Pourian: And, in my case, I've given it some thought. There's a few things I would change, but one of the major things that I would change, and this goes with ... I think with every relationship is to set expectations ahead of time. And there's different stages that you're going through like you mentioned the honeymoon period and all that stuff. There's different stages of the relationship that you're going to go through that you have to set your expectations. 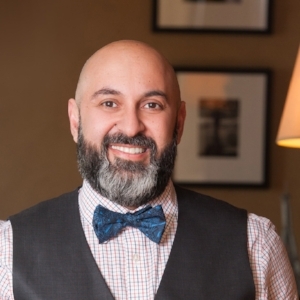 Kianosh Pourian: One of the ... My wife and I have been married for about 13 years, but one of the things before we got married, in our engagement period, she came to me one day and she said, "I think we should go to a couple's therapy". And I was like, "What? Is there something wrong?" Kianosh Pourian: I thought that was a brilliant idea. I think that should be done in a business, because business ... whether you think about it or not, it's nothing less than a marriage. You pretty much spend more time with your business partners than you do in your marriage sometimes. Kianosh Pourian: So, to set those expectations ahead of time would have been very, very key for me and I honestly ... I wouldn't put it beyond going to a ... some sort of a business therapist, business coach of some kind with the partners that you're about to get into and say, "Hey, this is the way I see our business going forward. How do you see it going forward?" Kianosh Pourian: So, things like that. So, I think that's the part that we missed that I would have gone back and I would have fixed that. Carl Smith: Well, yeah, if I had done that couple's therapy with my wife, not to harp on the towels thing, but I would have been able to say, "I just want you to know, towels are not my strong suit, but I'm really good at raising kids, I've been told". Kianosh Pourian: You mention the towel thing. I got that towel thing the other day. Apparently I'm supposed to fold it in threes and not in twos. I did not know this. Carl Smith: It's all based on the shelf size, man. It's all based on the depth and the width of the shelf. It's insane. Different shelves may actually have different folding techniques. Carl Smith: So, what are you doing now? So, it's been about four months, right? Kianosh Pourian: Yes. Yes. So, it's been a journey for me. So, for me, any point of my travels in the business world, I've made it a learning point and I think with this one I learned a lot. I learned about how to treat partners, how to deal with partners, how to manage expectations and things like that, because for me, not only was Spiria a partner of mine, but I had two other partners that came over from Iotopia. Kianosh Pourian: So, I kind of sat in the middle there and I learned that I need to be more transparent, and more open, and more ... set expectations with my partners. So, for me right now, I'm trying to figure out if the service industry is the right place for me to go or building a product is what I want to do. Kianosh Pourian: Yeah. And I think the reason I say this is because as I go out there and fill out applications to become a Director of Technology or Vice President somewhere and I talk to CTOs and CEOs and things like that, I feel like in the back of my mind I have this jealousy towards them that they are building something and I am just going to be helping them. Kianosh Pourian: And I want to be that person that builds something. So, I think everything in my body and my bones, they are telling me, "Go take one of your ideas that you have in your notebook and start building it". So, I think that's the direction I'm going to go with it. Carl Smith: Well, I recommend that you do that, because if you don't, it's going to undermine everything else you try to do if it's constantly in your brain, says a voice of authority, or at least experience. Kianosh Pourian: No, I agree. I agree with you completely. I think ... and that's the other thing that I've learned is to listen to your intuition. If a voice in the back of your head tells you, "This is what you should be doing," or "This client doesn't seem like he's very up-front with you," I've learned that the times that I didn't listen to my ... to that little voice in my head, I've paid for it. Kianosh Pourian: So, I think from now on I'm just going to let that voice speak loudly. Carl Smith: Well, I think you're making the right decision and Kianosh, I'm so glad you came on today and shared your experiences with the community. Thank you. Kianosh Pourian: Thank you. I'm very excited and I appreciate you taking the time. Carl Smith: You're totally welcome. And for everybody listening, we'll talk to you next week. All the best.